The Inclusion Paradox:The Obama Era and the Transformation of Global Diversity – 3rd Edition explores what it takes to move into the next generation of diversity work so organizations can grow business and attract and retain the best talent. The work of diversity and inclusion has never been more urgent, particularly as all aspects of our lives have globalized on a massive scale. The 3rd Edition offers many practical and strategic solutions for how anyone, including business, diversity, and human resources leaders, can make organizations and the people in them stronger, more productive, and more successful. Practical and strategic solutions to make organizations and the people in them stronger, more productive, and more successful through diversity and inclusion. It turns out that the warm, let’s-all-get-along connotations of inclusion are misleading. Achieving true inclusion is hard. Very hard. Harder than achieving awareness. Harder than achieving tolerance and sensitivity. Harder than diversity itself. Paradoxically, in many ways it’s become easier and more hip to talk about diversity and inclusion. Around the world corporations, not-for-profits, educational institutions, police departments, governments and the military are catching on that the workforce is changing in dramatic, unstoppable ways. They grasp that these changes raise myriad implications for how organizations hire, manage, develop, promote and reward their workers in ways that motivate them to stay and do their best. The Inclusion Paradox: The Obama Era and the Transformation of Global Diversityexplores the impact of the Obama phenomenon not from a political but rather from a cultural perspective. Sure there are myriad political implications to be made, anywhere from an analysis of Blue State / Red State shifts to legitimate policy debates. No matter how these things get hashed out, in addition there is an undeniable, transformative, culture-change story is unfolding that includes all of us globally. There are profound cultural implications of an Obama Era to culture in the United States as well as globally that will affect our personal, group, and institutional relationships and how we go about doing our work strategically and day-to-day. Regardless of one’s political preferences and passions, we are all players in the culture-change drama. The Obama Era will have particularly profound implications for today’s and tomorrow’s emerging workforce. The culture one lives in, whether it is stable or in the midst of transformative change, shapes what we believe and our actions for surviving and thriving within it. An increasingly multicultural workforce will require deeper understanding of culture from many different angles–not only what cultures are in the mix and which cultures individuals are from, but what these individuals therefore believe, how they act, and why. Which brings us to a concept I refer to as the Inclusion Paradox. I will use this concept to explore various cultural dimensions of the Obama Era. But before we can define the paradox, we need to first distinguish between diversity and inclusion. Often these terms are bandied about as synonyms. 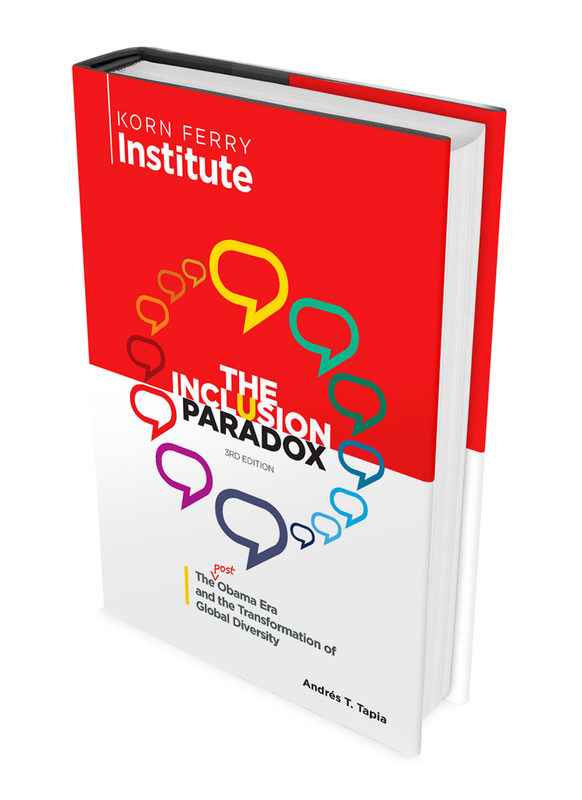 In The Inclusion Paradox, I offer a differentiated view of these two terms — one that has resonated with clients in diverse industries and different countries. Many current diversity best practices have focused on bringing those who are different in the door. Hence the focus on recruiting ads, recruiting fairs, CEO statements to attract candidates and tapping into affinity groups to help with the recruiting itself. Many of these efforts have been quite successful, and companies have achieved diversity — the mix. But in many places, the mix is not working well. Hence we have diversity without inclusion. Here, diversity’s promise — that greater diversity leads to greater innovation and profitability — dies. Without inclusion, advancement becomes difficult. Good management and leadership skills manifested differently than the organization’s mainstream do not get recognized or affirmed. And, rather than leading to new ways of doing things, “different” ends up being defined as poor performance. How do we achieve both diversity and inclusion? For starters, we must challenge the long-standing,“ best practice” belief that to achieve inclusion we need to minimize differences. This stance, it turns out, only papers over differences that truly exist. Those undiscussed differences lead to invisible group performance degradation. Workers who feel pressure to conform, to “just all get along” push their unresolved emotions and differing beliefs into their subconscious, making them more difficult to manage. The antidote? Rather than minimizing differences, we need to call them out constructively. Calling out and using each others’ differences will unleash the true creative contributions of diverse perspectives that, as they play off of each other, lead to better work relationships, greater innovation and profitability that benefit individuals, teams and organizations.